Want to know who will win today? In Today’s Dream11 Fantasy Cricket Prediction RCB vs DD 45th T20 Match IPL 2018, we will cover pitch report of Feroz Shah Kotla, Delhi, playing 11 and toss prediction. We will also cover all the latest news and prediction of Delhi Daredevils and Royal Challengers Bangalore, players recent and past performance, dream 11 best team, weather report of Delhi, dream11 guru prediction, key players, the best choice for captain and vice-captain, where to watch the live match of DD vs RCB and details of live streaming. To win any fantasy league, you must have all the above information and crix11 provides all the info for free. Yes, absolutely free. Make sure to read the complete post to get 100% benefit. We provide tips and tricks on every section of the post, so make sure to read them carefully and make your winning team for fantasy leagues. Who Will Win the 45th Match of IPL 2018 Between RCB vs DD and Toss Prediction? What is the best combination of players for Dream11 in 45th Match? Date: The match will be played on 12th May 2018 (Saturday. If we look at the last matches played here, all the games witnessed high scores except one game. Initially, the pitch will be slow and as the game progresses it will become a batting-friendly. The batsman can score big if they play smart on this pitch. The spinners will get some help from the wicket. In today’s match, a high score is expected. On Saturday, 12th May, it will be a sunny day throughout the day. The sky will be clear. Cricket fans and fantasy users can enjoy the full match as no rain is expected today. The temperature is expected to be 36-Degree Celsius and the humidity to be 31%, which may rise up to 44%. In last five matches, DEL won one match out of five matches and BLR won four matches out of five matches. In overall encounters, RCB won 13 games and DD won 6 games. At this venue, Royal Challengers Bangalore won five games and Delhi Daredevils won two matches. It will be interesting to see which team improves their record today. Star Sports has paid a huge amount of INR 16,347.50 Crores to get exclusive rights of IPL 2018 for live coverage for five years starting from 2018 to 2022. Star Sports has all the media rights including TV and all Digital Rights. You can watch the full match of Delhi Daredevils vs Royal Challengers Bangalore, 45th match on Star Sports. Virat Kohli (c), AB de Villiers, Mandeep Singh, Tim Southee, Pavan Deshpande, Sarfaraz Khan, Quinton de Kock, Parthiv Patel (wk), Kulwant Khejroliya, Manan Vohra, Navdeep Saini, Moeen Ali, Washington Sundar, Colin de Grandhomme, Aniket Choudhary, Aniruddha Joshi, Yuzvendra Chahal, Umesh Yadav, Murugan Ashwin, Chris Woakes, Mohammed Siraj, Pawan Negi, Brendon McCullum, Corey Anderson. Prithvi Shaw, Shreyas Iyer (c), Abhishek Sharma, Glenn Maxwell, Rishabh Pant (wk), Junior Dala, Liam Plunkett, Jason Roy, Manjot Kalra, Vijay Shankar, Mohammed Shami, Sayan Ghosh, Shahbaz Nadeem, Amit Mishra, Gurkeerat Singh Mann, Harshal Patel, Rahul Tewatia, Naman Ojha, Trent Boult, Gautam Gambhir, Jayant Yadav, Colin Munro, Sandeep Lamichhane, Avesh Khan, Daniel Christian. Still, both the teams have a chance to make to the playoffs. Both the teams have lost their last match against Sunrisers Hyderabad and will be desperate to win today’s match. Both the teams have six points in their pocket will love to make it 8 points after the match. It will be interesting to how both the teams make their playing 11 combinations. RCB may make some changes in their team. Brendon McCullum or Quinton de Kock may get a chance in place of Moeen Ali and Washington Sundar may play in place of Manan Vohra. But this is very unlikely to happen. Kohli may play with the same playing 11. Virat Kohli (c), Quinton de Kock/Brendon McCullum, Yuzvendra Chahal, Parthiv Patel (wk), Colin de Grandhomme, Tim Southee, AB de Villiers, Mohammad Siraj, Washington Sundar, Mandeep Singh, Umesh Yadav. After losing their previous game, DD may like to make a couple of changes. Colin Munro may get a game in place of Jason Roy. As Delhi Daredevils are at the bottom of the table, there is a good chance that they can give their bench a chance but this is very unlikely to happen as they still have a chance. Jason Roy/Colin Munro, Rishabh Pant (wk), Vijay Shankar, Amit Mishra, Trent Boult, Prithvi Shaw, Shreyas Iyer (capt), Glenn Maxwell, Liam Plunkett, Harshal Patel, Shahbaz Nadeem. Pro tips: Rishabh Pant is in good form. You can keep him over Parthiv Patel. Make a combination of the above players for multiple teams. Pro tips: The above bowlers are most likely to take wickets today. Make a combination of players for multiple teams. Royal Challengers Bangalore has a better record against Delhi Daredevils. Both the teams have a chance to make it to the playoffs and both the teams will be desperate to win today. Cricket experts are saying that DD will win today’s match but according to our astrology prediction, RCB will win the match. The pitch will be slow in the initial half and get better and better as the game progress. So the team winning the toss should opt to bowl first. Dew will also come into play in the second half of the game. According to our prediction, BLR will win the toss and they will ask DEL to bat first. As it is predicted that the pitch will get better as the match progresses, so take more batsmen in your teams. Try to take Kohli and Ab de Villiers on your team. Iyer and Shaw is a player who can contribute you maximum points. Make a combination of spinners and seamers in your teams. You can keep Moeen Ali in your grand league team. 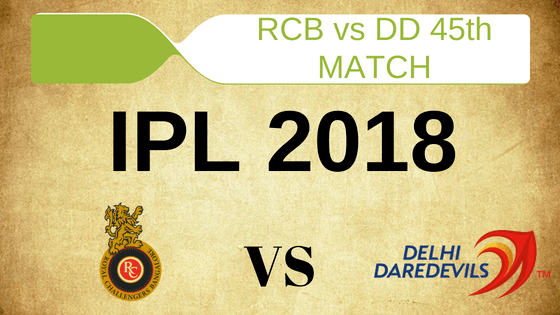 Conclusion: This is it for Today’s Dream11 Fantasy Cricket Match Prediction of RCB vs DD, 45th T20 Match, IPL 2018 which will be played on Saturday 12th May. You can give your valuable feedback in the comment section. Subscribe to our notification of latest updates. GOODBYE!